A locksmith understands that shopping for locks can be challenging. There are a wide range of options and each type offers varying security features for consideration. This page will provide an overview of the most popular options and how they work. There are three primary options for dead bolts. The first one is a single-sided lock that's standard sized. A key cylinder is located outside with thumb-turns inside that make this lock one of the more popular locks for houses. Another type is known as the double dead bolt, comprised on a key cylinder on the outside and inside. This type of dead bolt requires a key to unlock. Locksmiths recommend a key be left on or near a residential double dead bolt should an emergency exit become mandatory. The third type is a lockable thumb turn. The user locks the inner thumb-turn adding great flexibility with regard to security. Padlocks have a limited variety. Basically, there are two options re-keyable and non-rekeyable. A locksmiths in campbelltown can change the key if the padlock is re-keyable. Padlocks may possess a shrouded shackle. This increases security as the shoulders of the padlock are raised up along the sides of the shackle. This function makes it difficult for bolt cutters to cut the lock. Commonly located on inner doors in a commercial location, lever handle locks have a big push-down handle for opening a door. Frequently chosen over a knob lock, lever locks are simpler to open with the push down feature, versus having to rotate the knob. Frequently found in residential dwellings, the knob lock is not a recommended source of security for the exterior doors. Because the locking cylinder is located inside the knob, it can easily be broken off or bypassed with the right tools. Locksmiths recommend replacing knob locks on exterior doors with passage knobs, providing similar security features of a dead bolt. Cam locks have various uses but are commonly used in file cabinets. The metal piece on the back is the primary variable when deciding among cam locks. Known as the "cam," it is the tailpiece of the lock and it borders the actual locking instrument. Cam locks come in a wide variety and a locksmith can assist if you need advice regarding the best cam lock for security. First and earliest type of lock in existence. The Yale duo (father and son) in the 1800s, are most famous for manufacturing this kind of lock, which is still used in the modern time, in many homes. This kind of lock uses a set of levers which in turn stop the bolt from moving in the lock. These locks usually uses a bitted key. This kind of lock takes advantage of a set of wafers which prevent the lock from opening until the right key is used. Many wafer locks are used in many cars and automotives. This lock is perhaps the simplest locks of all. You just need to key in the correct combination to open the lock. It may sometimes be a rotating dial, or a set of knobs. 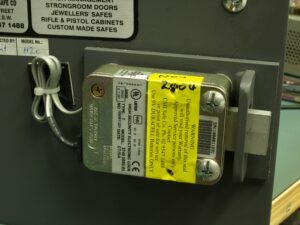 The interior is using discs to that has inscribed numerals that is directly connected to the mechanical or electrical keypad. Copyright © 2018 All Solutions Locksmiths. All Rights Reserved. Master licence: 407733417.